The Montgomery County Community Foundation was pleased to award $250,250 in new and renewable scholarships to students of Montgomery County High Schools. We want to congratulate ALL Montgomery County graduates for a job well done and we wish them the very best in their future endeavors! 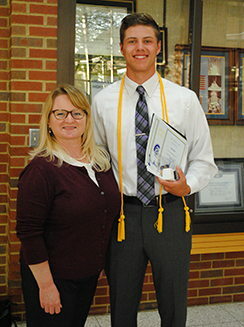 It is always an honor for us to be involved in Honors Night at all three county high schools and make these awards. Many of our scholarship awards are generated from funds set up in memory of loved ones who had a desire to help further education in our youth. They left behind a tremendous legacy and their imprint will be evident for generations to come. Due to the generosity of all our donors and their commitment to the future of our community, we have awarded a total of over $6 million in scholarships since 1994 to thousands of county students. The Montgomery County Community Foundation supports and encourages educational achievements and we encourage you to check out our Scholarship pages for information on how to apply for a scholarship, or how to contribute to an existing fund. To see a complete list of 2017 MCCF scholarship recipients, please click the link below.